The new SEAT Mii Hatchback is essentially the Spanish brand’s version of the popular Volkswagen Up! – but even cheaper. It’s just as spacious as more expensive cars, fun to drive, and is a must on anyone’s shortlist who’s on the lookout for a bargain basement, cute new city car. There isn’t much to choose from on the engine front, but this just means that you don’t need to spend ages making your mind up. Instead, SEAT allows you to get straight to the point in a no-frills car that finessed its Euro NCAP crash-test and can manoeuvre tight corners in the city with impressive ease. OSV takes a closer look at what it’s all about with our 2017 SEAT Mii Hatchback review. Because the new SEAT Mii doesn’t cost much to buy, you can’t expect it to be too powerful. Instead, while it develops just 74bhp at the most, SEAT have compensated by turning it into an excellent handler that’s lively on the move. It’s a super fun way of getting to work and back. Its gearbox is slick, it doesn’t weigh too much at all, while solid steering further contributes to a pleasant driving experience. Moreover, its suspension setup does a good job of absorbing coarser road surfaces so that you don’t feel too many bumps and lumps. On the motorway, it feels nicely settled for a city car. In fact, we’d go as saying that the SEAT Mii is right up there as being one of the most capable long-distance city car cruisers. Add the optional cruise control, and spending an entire Sunday cruising with your Mii will be a charming experience. In terms of the engines, there is just one available. It’s a spirited 1.0-litre three-pot petrol unit that’s offered in two different power outputs. The entry-level models are restricted to just 59bhp, while the FR-Line trim is able to produce up to 74bhp. Rock ’n’ roll! Where everyday driving is concerned, however, all engines feel mostly the same. As such, we don’t recommend you pay extra for a higher-trim model unless you want the extra bits and bobs that come with the kit. That said, the FR-Line trim is a bit sportier, and gets a stiffer suspension setup. The bonus is that it leans less in bends, but overall ride quality isn’t as comfy. Where comfort and space are concerned, the SEAT Mii Hatchback doesn’t just compete with its nearest rivals – it can also compete with more expensive, supposedly bigger cars. Despite its affordable price tag, the Mii doesn’t get saddled with a squeezed, poor-quality interior. Instead, the SEAT has put together an intelligent layout that’s built to last, and which can boast some top-notch plastics here and there. It looks and feels good. Insulation is our only real criticism, as the petrol engine is prone to making a din when you accelerate. Still, we wouldn’t say its noise is all that unpleasant. The dashboard is simply and tastefully done. The controls are clear, bold and easy to find and use. 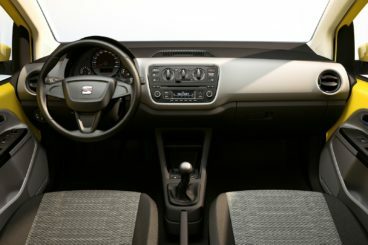 The standard models get a plastic steering wheel, but if you upgrade to the Design Mii trim, you get treated to a leather-trimmed wheel. It’s nice touches like this that make the SEAT Mii such an attractive proposition. The car is practical, too. It’s easy to get into the rear seats, thanks to doors that open wide, and there is a three-door and five-door option available. The five-door model is easier to access, but both cars boast a number of smart touches that enhance practicality. Four adults will have a decent amount of space, with the only issue being legroom. Kids, on the other hand, will have no such worries. If you need a car for the school run and your commute to work, this one has strong credentials. Storage space is strengthened by a few well-sized door bins and a reasonably-sized glovebox, while the 251-litre boot is big enough to rival cars from the next class. Fold the rear seats, and the five-door version can increase its luggage capacity to 959-litres. The three-door version, meanwhile, can increase its capacity to 951-litres. The standard kit further enhances the Mii’s status as a superb value for money car. Included in the listing price for the entry-level model are a six-speaker stereo, remote locking and air conditioning. However, the Design Mii trim gets more essentials, including alloys, TomTom sat-nav, Bluetooth, a colour screen radio, split-folding rear seats and electric front windows. FR Line models add a sportier flavour, including vinyl stripes for the doors and 16” alloys. Where safety is concerned, there isn’t much to worry about. 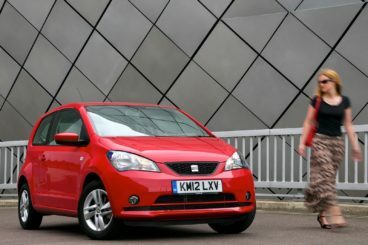 The SEAT Mii scored all five stars when it was crash-tested by Euro NCAP, and comes with plenty of standard safety kit. This includes anti-lock brakes, stability control, ISOFIX child-seat mounts and traction control. Prices for the new car start out from £9,795 and rise to £11,830. If you prefer to lease, you can pick up a deal from £147 + VAT per month. For more information on our leasing deals, check out our page here. In terms of its running costs, the Mii gets our thumbs up. The economy isn’t as good as last time, and it’s not the most frugal in its class. But returns of 64.2mpg are good. Moreover, fuel economy is the same, regardless of which variant you plump for. It emits just 102g/km of CO2, which means you’ll be paying £20 a year in tax, while the entry-level model sits in insurance group one. The most expensive Mii Hatchback sits in group four. Naturally, the first thing a city car must do is be able to cope with urban life easily. This can, but it also adds a keen sense of fun. It’s surprisingly roomy in either the 3 or 5-door variant, with SEAT doing a grand job of getting the most out of its small dimensions. Four people can sit in comfort, there are plenty of useful storage spaces, and the boot measures an impressive 251-litres. The lack of an auto ‘box might disappoint some. The pop-out rear windows are the only contentious issue on the practicality front. Let’s see how the car fares against its rivals in the comparison section of our 2017 SEAT Mii Hatchback review. The new Citroen C1 Hatchback is a funky looking, ice cool city car that offers an optional fabric roof. Citroen has decided to go with the same underpinnings as last time, with the result being that body lean in bends is still an issue. This means that the car isn’t as fun to drive as the Mii, although comfort is assured. Light steering is a positive, as it makes it easy to negotiate tight turns in the city. However, there isn’t much feedback, which hardly inspires you with confidence. Like the SEAT, there aren’t many engines to choose from. Kicking things off is a 1.0-litre engine that’s been brought over from the C1 Hatchback’s predecessor. It’s noisy, needs to be worked hard, and takes 13.0 seconds to complete the 0-62 dash. A more pleasant option is a 1.2-litre petrol engine that has a bit more oomph, doesn’t make as much noise, and takes just 10.9 seconds to get you from rest to 62mph. It has a better turn of speed, keeps up with traffic, and feels good on the motorway. In terms of its running costs, the 1.0-litre engine is the most frugal. It can return as much as 68.9mpg, and emits 95g/km of CO2. The bigger 1.2-litre engine is barely any more expensive to run. It, too, emits less than 100g/km, and averages 65.7mpg economy. However, if you pair the 1.0-litre engine with the CGT automated manual transmission, the economy does take a bit of a dip. Both models cost £140 to tax after the first year. Inside, the Citroen C1 Hatchback can’t compete with the SEAT. It sports cheaper plastics and doesn’t feel as sturdy. On the flipside, it’s comfortable and there are a few colourful design flourishes that will appeal to younger drivers. There are a number of trim options to choose from, too. Overall, though, the SEAT wins in terms of quality and feel. 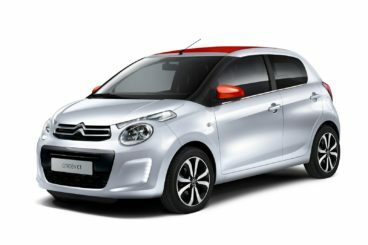 Is the Citroen C1 Hatchback practical at least? Not really. The driver and their passenger will have plenty of room up front, but the rear is cramped. Moreover, the boot measures just 196-litres, which put it way behind the SEAT Mii. It does come with a wide opening, but there is no false floor. Worse still, a large load lip is impractical. The new Peugeot 108 Hatchback is a smart-looking, cheap to run city car that’s a solid rival to the SEAT. It’s not as entertaining as the Mii Hatchback, but it’s a lot better on the move than its 107 predecessor. The ride quality has been improved, and the steering is now lighter. As far as cars designed exclusively for the city go, the Peugeot 108 is as good as they come. Again, there is no option of a diesel engine, but we don’t think that’s a bad thing. The sprightly 1.0-litre petrol engine offered here buzzes around the city as though it’s been doing it all its life. That said, if you’re planning to spend a fair amount of time on the motorway, we recommend upgrading to the bigger 1.2-litre engine. Where the 1.0-litre unit does 0-62 in 14.3 seconds, the 1.2-litre power plant does it in a respectable 11.0 seconds. However, you can only get this engine if you’re prepared to spend a bit more on the more expensive trims. In terms of running costs, the 1.0-litre engine is naturally the cheapest to run. It can average 69mpg economy, and emits 95g/km of CO2. The differences between the two engines are, frankly, marginal though. The bigger 1.2-litre petrol returns 65.7mpg, and almost emits under 100g/km. Like most city cars, both models cost £140 a year to tax after the first year. Peugeot has clearly been hard at work on making the 108 a more pleasant place to be inside. It’s comfier than last time, and sound insulation has been improved. The dashboard has been simplified and now looks a lot cleaner, while models above the entry-level trim get a 7” touchscreen as standard. 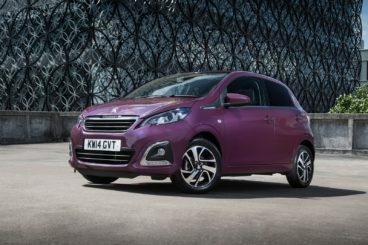 Overall, the new Peugeot 108 Hatchback feels more mature than last time, and it comes with a good amount of standard kit and safety features. In terms of how practical it is, there is a three-door and a five-door version available. However, if your budget can’t stretch beyond the entry-level model, you’ll have no choice but to take the three-door variant. Either model is short, which means it’s great for darting through traffic and parking. But it also means that rear seat space is cramped. Four adults can sit inside here – but at a squeeze. Storage space is decent if predictable, with a few door bins and a modest-sized glovebox helping you keep the place clean and tidy. The boot, meanwhile, measures 196-litres. That’s much smaller than the Mii, but a low load lip at least makes it usable. There is a lot to love about the adorable but assertive Mii. It’s great to look at, great fun to drive, but also has plenty of substance. You won’t meet a more accommodating city car, while economy is as low as 64mpg. The new SEAT Mii Hatchback is 100% one of the best city cars on the market right now.